Over the last few years, the amount of Pop Culture and Comic Conventions have grown exponentially with the popularity of DC and Marvel Movies and the return of Star Wars to the Theaters. 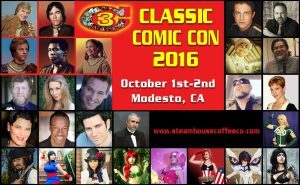 On October 1st and 2nd at the Season Events Center on Mc Henry, there will be yet another one Classic Comic Con. Classic Comic Con celebrates the history of Science Fiction and Comics with a strong dose of Steam Punk. Meet Celebrity special guests, including several cast members from Battlestar Galactica, Power Rangers. Add to this local and regional Cosplayers and fan clubs. 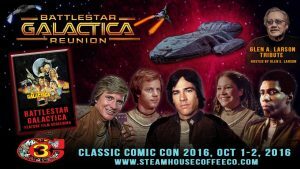 Check out the great things that Richard Hatch has to say about #ClassicComicCon2016 in this fun clip! 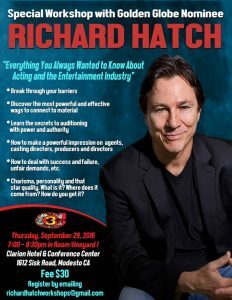 Richard will be teaching a pre-convention acting workshop that’s open to all on Thursday, September 29th at the Clarion Modesto. He’ll also be hosting a solo panel and participating on our #BSGreunion group panel with Dirk Benedict, Jack Stauffer, Sarah Rush and Herbert Jefferson, Jr. In addition, we’ll be screening Richard’s #steampunk short film Cowboys & Engines during our film festival – don’t miss it – very cool project! Speaking of the #BattlestarGalactica reunion panel, be sure to send in your #BSG related questions if you can’t make it to Modesto, CA for the convention. We’ll try to pick a few to have answered during the panel by our distinguished guests. Email your question(s) to bsgreunionpanel@gmail.com. Enjoy two days of family-friendly entertainment. 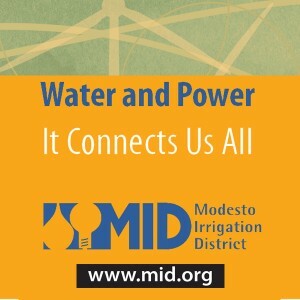 There will also be a costume contest with prizes, film festival, car show, autographs, panels, workshops, vendors, collectibles, comics, artisan crafts, music(The Dramatics will be performing), live entertainment and much more! Affordable day ($15) and weekend ($25) kids under 14 free with a paid adult.